Happy Hallowe’en to you. 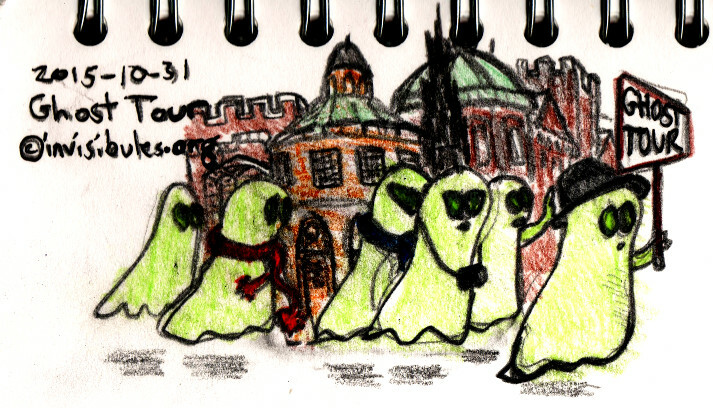 We were sitting in Broad Street in the sunshine today, next to the man drumming up support for the ghost tour of Oxford (which happens year-round, incidentally,) and this comic more-or-less drew itself. The colouring was supported by a slice of apricot and lavender cake at the Bodleian’s new café. I wonder if ghosts find sunshine as spooky as humans find darkness? Even ghosts need hats & scarves in London! We took one of those tours … in Scotland. They ARE spooky!